Hi there, I have been attempting to tackle this issue with my abs system for a while now. I have got frustrated to the point that I have searched for a forum and have found nissaclub. I am getting a code for my rear left abs sensor. I have tried 2 other sensors from other cars and they haven't worked. I have tested resistance of these sensors and they all measure around 1.03. My working sensor also measures the same. I thought maybe it could be something with the ring inside the wheel bearing then, so I tried a different wheel bearing. Code still comes back right after I clear it. I believe I could have an issue with the wiring of the actual connector. I tried to measure voltage to the wire, but here is the weird part. I get 0v from any pin. I am grounding to the chassis and trying both pins of the connector. I have also tried the working connector and I get 0V even though there is no code for that connector. I also get a code when I unplug that connector so I know it is not an issue with the computer. Another weird thing is when I attempt to test for AC voltage by spinning the wheel none is created by either sensor. This is even more confusing. When you had the hub off, did you clean the sensor ring (flat disc on end of hub that lives inside the rear knuckle)? As long as there is no build up of rust powder, the ring should work well. You won't be able to 'see' the voltage produced by the sensor unless you have 'microvolt' capability. 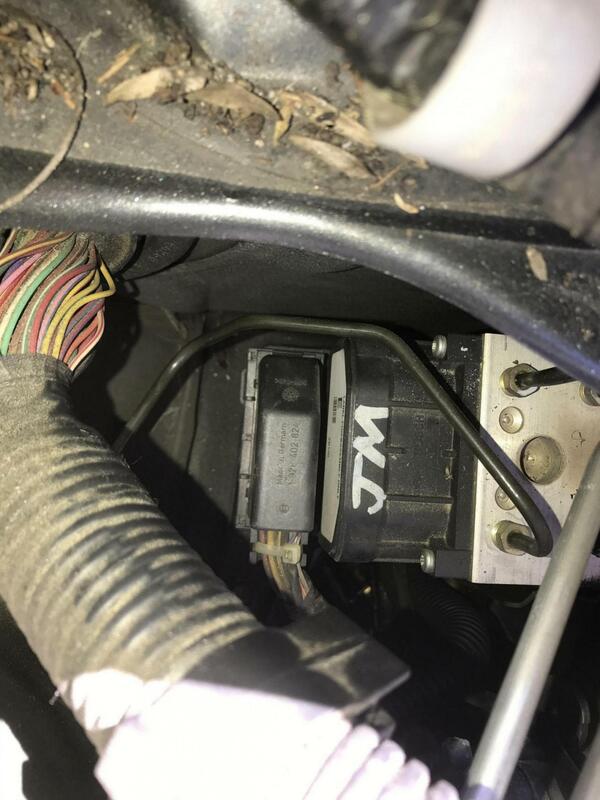 Based on issues with another similar vintage car, I would say your wiring is most likely the culprit...and it's most likely at the big connector at the ABS controller in the engine compartment...those contacts are known to corrode (greenish coating). Have a look there and while you're in there, beep out (continuity) and also perform a resistance test of both the rear lines (while sensors are disconnected!). I'm not sure what you mean by flat disc, but I cleaned all surfaces that the wheel bearing mounts to. Are you talking about the surface that the plastic guard mounts to? I also cleaned the bearing ring itself. Squeaky clean with brake cleaner. Also got a shot full of it in my eye . There was a slight bit of rust, but I'd barely call it surface rust. I doubt it's interfering. I will check the big connector right now and update you with what I find. Will also test the rear lines. Thank you for the help! 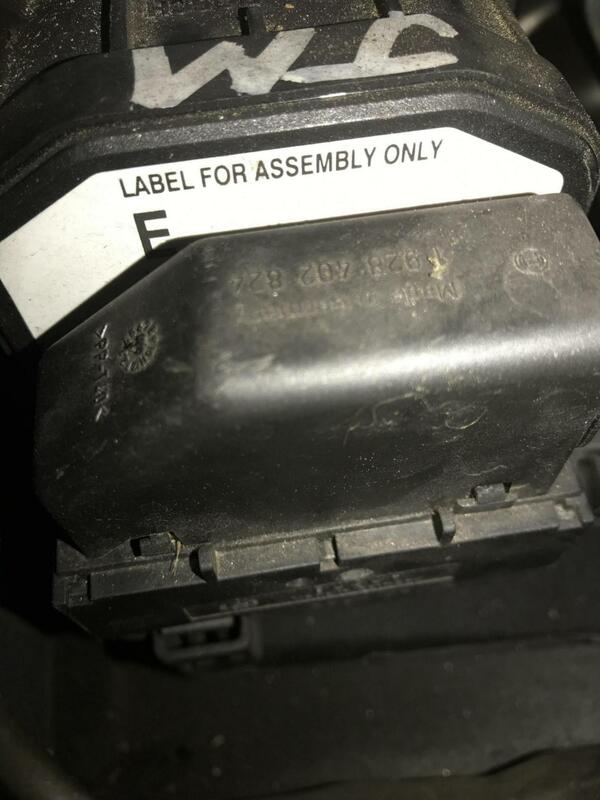 So I see the abs module, I’m not sure where the main harness connector is though. Is it easily accessible or do I have to take some things apart to get to the ABS module? Okay, I think I have an idea on how to do it now. I think I am going to head to the junkyard, see if I can remove one of the abs harnesses there, and clean+replace it with that one for good measure. Will update, thank you for the help so far! This is the sensor ring I was referring to, opposite side of the bearing from the wheel studs. I also tried to remove the entire harness from the body of the car from the junkyard, but it seems to be a more complicated system than I thought. Sadly it doesn't just run from the front to the back of the car. There's some sort of plastic unit in the back that it connects to. Very confusing. Hopefully I can just clean the connection and be good to go, but I'm not gonna get my hopes up. Don't you think a corroded connector would cause more problems than just a code for a single abs sensor? Yes an intermittent connection could cause just one signal to fail (for now, more to come for sure). You'll know as soon as you get the connector apart whether this is a likely reason or not. In M-train's case, it was one of the CANBUS wires which meant that the car computers could not talk to each other and it was throwing a U1000 code. I read through the thread, I think the ring is adequately cleaned to be honest. I'll get it squeaky to be certain. Could the ring be damaged inside the bearing? I haven't got a chance to work on it today but hopefully I can squeeze it in before tomorrow. You're really providing me with a lot of information here, thank you. Weird to think a 100k mile Georgia car can have bad corrosion in electrical connectors. The only other questions I have, is there a common place where the wiring harness gets damaged? And are there any other connectors besides the main abs controller that corrode? If not then I think I can tackle this job. Thank you! I'm sure your ABS ring is fine. When it gets coatedin rust dust...it just triggers randomly when braking. That's funny, I actually grew up in norcross georgia. I'm over by woodstock now if you know where that is. Still haven't got the chance to work on it.... but today I will for sure. Tell me about it haha! Nissan Forums : Nissan Forum > Nissanclub.com Nissan Enthusiast General Forums > New Member Forum - Introduce Yourself! In order to be able to post messages on the Nissan Forums : Nissan Forum forums, you must first register.